But besides the fact that you should watch this show, something to take away from it for me has been ‘Treat Yo Self’, one of my 2016 Commandments. Donna and Tom are great, they believe fully in themselves and therefor they feel they deserve to treat themselves once a year to all things good. You might find it odd that I am writing about this on my blog, but I completely agree with Donna and Tom (and the writing staff at Parks and Recreation). You are awesome, so you should treat yourself sometimes (or all the times). And perhaps reading it here helps you to book that spa appointment or buy that dress you’ve had your eye on for a while, because you should Treat Yo Self. So now you might be wondering what I have done to treat myself, and I will tell you. 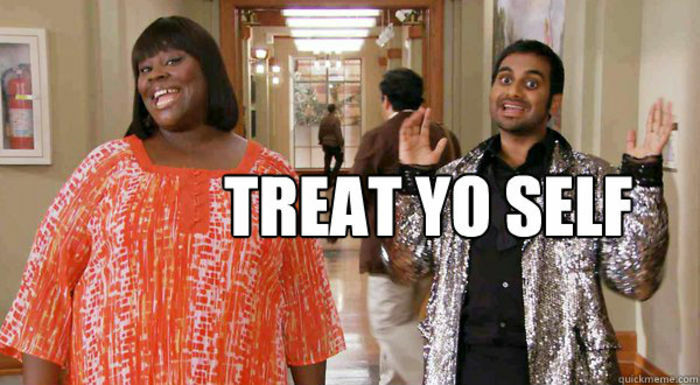 I love to shop, but not on a ‘Treat Yo Self’ level like Donna and Tom in the video above. So I thought about what I had always wanted to try, but felt like it might be too expensive: getting a facial. Thankfully I have great friends and one of them suggested a while ago to get one together. I decided to not think to hard on it and just let her book an appointment for both of us. We went to ‘Skin Face 2 Face’ in Delft and both had an hour long appointment, which included a facial and a shoulder and neck massage. The people there were really nice and the treatment felt amazing. It was wonderful and I will probably treat myself to something like this again in half a year or a year. So what have you always wanted to do or buy? Isn’t it time to Treat Yo Self and do something a little crazy, just once a year just because it feels good? Let me know what you would want to do in the comments below!